Teijiro Toyoda was born in Japan in 1885. He joined the Japanese Navy and by 1941 had reached the rank of admiral. In April 1941 Fumimaro Kondoye appointed him minister of commerce and industry. A post he held for three months before becoming foreign minister in July 1941. He was removed by Hideki Tojo and became president of the Nittetsu-Nihon Iron Manufacturing Company and chairman of Tekko Toseikai Iron and Steel Company. 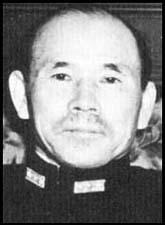 Toyoda returned to power as foreign minister under Kantaro Suzuki (5th April 1945 - 17th August 1945).